"Everyone's hooked up, you were the last, and you were boring"
Thank you, Shirleen. I couldn’t have described Ally any better. I had high hopes for this one, considering it’s the last in the series. I didn’t necessarily hate it; I just didn’t LOVE it like I originally thought I would. I probably hyped myself up for this book that it’s my own fault that it didn’t live up to my expectations. 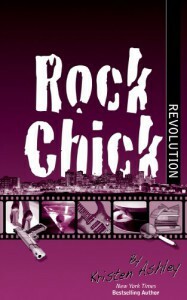 Going in, I already knew that this was Ally’s story but unlike the rest of the series, which focused on the Rock Chicks and their significant others, this revolved solely on Ally. I was disappointed that Ren was barely highlighted in this one. I completely loved all of Ren’s scenes and I wished I got to know more about Ren, not just snippets of him.